Some GPs jumped for freedom as the keep net are too small to contain all the fishes. 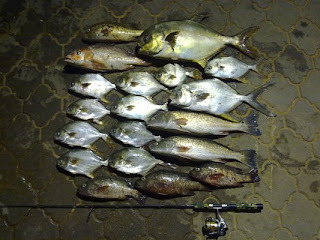 My catch of the night, which my GP weights at 1.67kg (by PP777). 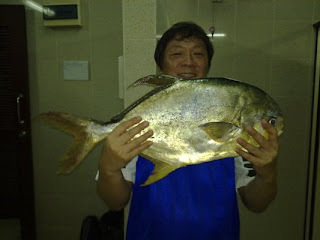 PP777's trophy catch at 4.32kg. Huuuuuuge!!! Oh my GOD! the eye look like pingpong ball!!! Way to go, my Bros!!! 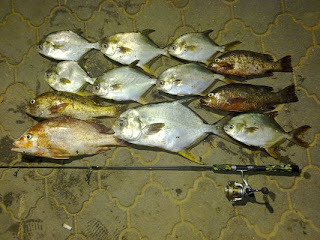 The fight was not really good, cause my drag set to quite tight when fishing for Kimchios. Also i think i got BULL kimchio n the others got the "bu" kimchios, their body colour are whiter n fairer. Hence add some spice to the CR Title. ha ha power la ... must have been dam good ! About to ask the team for dinner again. Cook porridge abit sayang leh,bro cf, we use it to do some creative new Kimchios dish, then our kakis can have more variety of choices. I vote dinner with Bull KC deep fried in thai sweet chilli sauce n my special belachan to go with. can do 2 tables,who is on? yong u photoshop edit tat GP rite!! i still haven't learn it yet.